Hops are the female flowers from the plant, humulus lupulus. Available in their Whole Hop Cone form or in Hop Pellets they contribute bitterness, flavor and aroma to your homemade beer. With more than 30 varieties available, there is a hop variety for every flavor and style of beer and there is no limit to the number of combinations you can dream up. 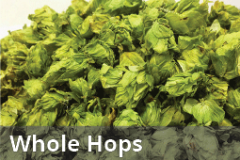 Hops are generally classified into two main categories: alpha and aroma. Some varieties feature characteristics of both, earning dual purpose status. High alpha, bittering hops, are added early in the boil process and provide bitterness to help balance the sweetness from the malt. 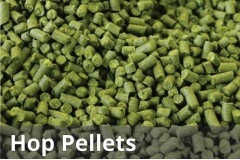 Dual purpose hops, or flavor hops, can be added in the middle of the boil to contribute to both bitterness and hop flavor. 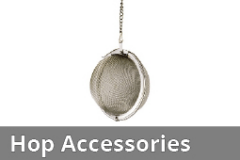 Aroma hops, or finishing hops are added near the end of the boil and contribute flavor or aroma to the beer. Aroma hops are typically used for Dry Hopping (adding hops directly to the fermenter after fermentation is complete) and will provide additional hop flavor and strong hop aromas to your beer.